LAST LUNAR CONJUNCTION! Venus and Jupiter are descending together into the sunset throughout July, following their big conjunction on June 30. Keep an eye on these planets on the evenings of Friday, July 17, Saturday, July 18 and Sunday, July 19 as the waxing crescent Moon joins the scene. This will be the last evening conjunction of the season between the Moon and these planets. 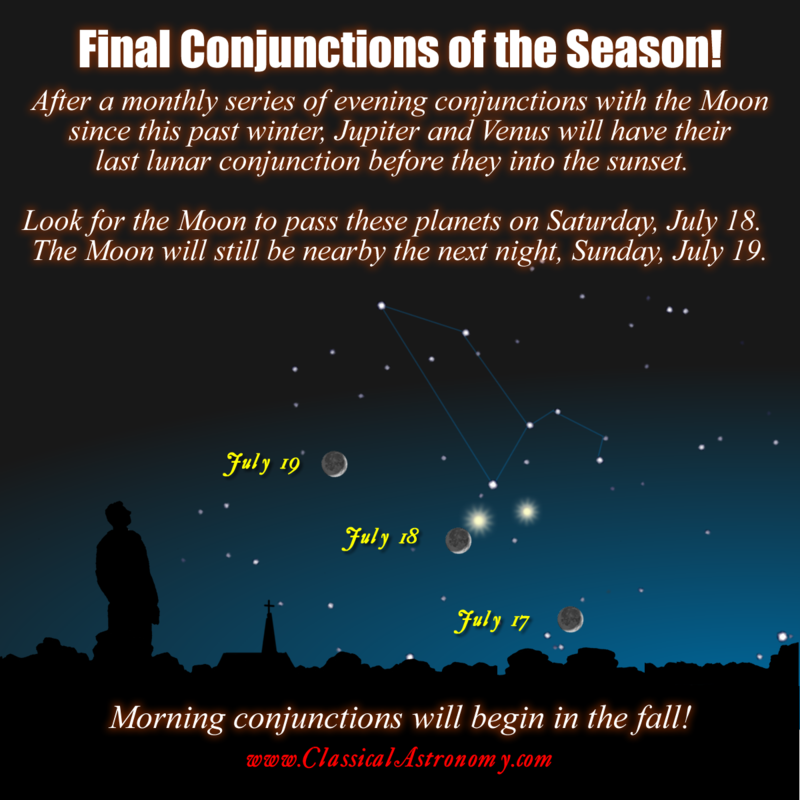 Morning conjunctions will begin the fall, after the planets emerge again from the other side of the Sun. Saturday is the night of conjunction, when the Moon passes especially close to Venus. You will need a clear, flat horizon, free of trees and buildings, to see the thin, three-day-old Moon alongside these planets as they hang low in the sky above sunset horizon. A view over water would be ideal, if you live on the Pacific coast, the Gulf coast of Florida, or on a west-facing shore of the Great Lakes. Click “like” on the Classical Astronomy FB page to stay posted on all these cool sky events! « Pluto – A Heart or a Dog?